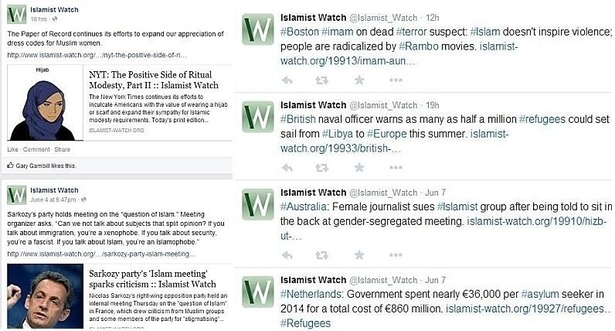 PHILADELPHIA – June 17, 2015 – Islamist Watch (IW), which protects the West from lawful Islamism, has launched Facebook and Twitter pages, bringing its message to new audiences. Readers are encouraged to "like" IW's Facebook page and "follow" IW's Twitter page to efficiently keep track of the project's activities. The information here complements what is sent out by e-mail. IW's social media provides readers with news, rapid analyses, and updates on its activities. In addition, by liking and following, readers join a community of citizens opposed to Islamic supremacist efforts to exploit Western freedoms to undermine from within. Islamist Watch on Facebook (left) and Twitter (right) provide readers with a convenient way to follow its news, analysis, and activism.